Thornbury Fire Station will be opening its doors to the public next weekend (Sunday 15 October). Visitors will have the opportunity to see some of the vehicles and equipment used by firefighters and watch live demonstrations showing how firefighters deal with fires and road traffic collisions. And for those interested in joining local crews on a more regular basis there will be the chance to find out more about a second career as an On-call firefighter at the station. The event takes place between 11am until 3pm at the fire station on Gloucester Road, Thornbury. Thornbury Station Manager, Dave Hodges, said: “This is a great opportunity for local people to come along and find out more about the work we do in their community. “Part of the role of the fire and rescue service is to provide safety advice to reduce the risk of fires. 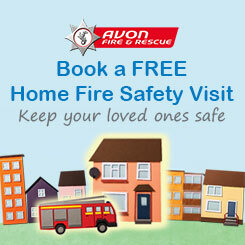 We would urge people to come along and talk to us about our free Home Fire Safety Visits where firefighters visit homes to give advice and fit smoke alarms for free, if required.